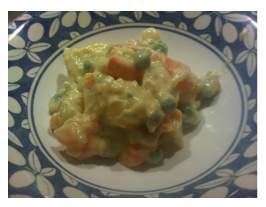 Recipe 43: Here in UK the chicken salad is prepared in a different way and it’s also a very typical dish. It’s called Chicken Ceasar salad and it’s made with salad, chicken, Parmesan and croutons. I have to admit that i really like this version too, but everyone needs to know that in Italy it doesn’t exist! The chicken salad we do it’s made of : chicken (i use normally one breast for 2 people), any type of salad, 3 spoons of mayonnaise, and some cheese and 1 carrot if you like it. Boil a chicken breast in hot water until well cooked. In the meantime wash cut place some salad in a big bowl. Then pass the chicken in cold water and start to cut it in little pieces. I suggest you to do it directly with your hands, so will be easier to have long vertical pieces. Add the chicken to the salad and then add also some little cheese cubes. I used Emmenthal but you can choose the one you prefer. Finally you can also add some carrots cut in “Julienne”style, also called “matchstick”. At this point I’m normally very generous and i add 3 spoons of mayonnaise, salt and a bit of balsamic vinegar because i like it a lot, but you can also add just some olive oil and even a bit of lemon if you like… there are so many different versions. For tomorrow in the office, this will be perfect! Buon appetito! PS. Ciao mamy, dopo tutte queste mangiate estive, tento di tornare sulla giusta rottae percio’ ho pensato all’insalata di pollo. Ok, non e’ proprio il massimo della dieta, visto che c’e’ la maionese, ma io usato quella light e poi se si mangia solo questo…. Recipe 44: After the holiday and a really busy week, here I am again with a new and easy recipe. This one is very quick and my mum sometimes did it for aperitif to guests coming for lunches or dinners. I love the mix of these simple ingredients, so it’ s something I do often also mixing it with salad: 3 eggs for person, 1 can of tuna, some cappers, some tomatoes (not cherry tomatoes but not even too big), mayonnaise and that’s all. Boil the eggs for around 8-1o minutes. In the meantime place some tuna, a spoon of cappers and some mayonnaise in a bowl. When the eggs will be cooked, pass them under cold water, take of the skin and cut in half. Remove the yolks from the eggs and add them to the bowl. Mix it all until create a cream and than place the cream back in the eggs. Same thing can be done with the little tomatoes and the taste it’s really good. Just cut the top of the tomatoes and take of the seeds and the interior. Replace it with the cream and close it back with the tap. They will be some really tasty bites! PS. Ciao Mamy, dire che non ho il tempo di respirare questa settimana e’ dire poco, ma delle piccole cure me le dedico sempre e percio’ mi sono preparata questo piccolo aperitivo per me sola! E chi m’ammazza?? Recipe 72: This is a classic dish of the summer because is a delicious plate to serve cold and so it’s perfect for summer parties too! For how much could sound strange to put together meat and fish, this 2 tastes together are just amazing! Ingredients for 3-4 people: 600gr of round of veal (of course in england it’s not so easy to find this cut so i bought a shoulder piece), carrot, celery, onion, olive oil, and white wine 1 or 2 glasses. Then for the sauce you will need 250 gr of tuna, 125 gr mayonnaise, some cappers, 1 anchovy fillet in olive oil. Let’s start from the meat cooking process: there are lots of different systems, you can boil it, you can marinated the night before (like my mum use to do) and cook it on a very low fire the day after, but because i have never enough time to do all this and I’m very scared the meat can become too dry or too hard, i decided to follow another way, that now i will show you. First of all put some olive oil in a pan and wait to reach the frying temperature. In the meantime clean you carrot, celery and onion and cut all of them very finely to create your “soffritto” (i used my amazing new machine for that). When this is ready pour it in the oil, turn the eat down and let gently fry for 10/15 minutes, until the blend of vegetables is light brown in color. Then add some white wine and increase the fire. Let everything cook until the wine is evaporated and place the meat in the pan and brown it all around. This operation that i ws thinking was going to be very quick, it will instead take a bit of time, so if you see the soffritto gets dry and close to burn or stick to the pan, add some water and wait for the meat to get a bit colored, turning it every now and then. When the veal is colored, pre-heat the oven at 1500 C, cover the pan with an aluminum sheet, then put it in the oven for about 50-55 minutes. Check periodically, and add water to keep the meat soft. The roast should be a bit brown outside, but pink in the middle. While the meat is in the oven, you can prepare the sauce. As you could have seen i didn’t add any salt to the dish because the sauce it will give all the taste the meat will need. Just put all the ingredients together and mix them: tuna, mayonnaise, some cappers and the anchovy without any fishbones. 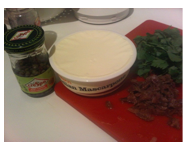 Use a mixer to do the sauce and if you see the ingredients are still to hard to mix, add some sauce form the meat. You will have a creamy and really tasty sauce! Let the veal cool in its broth, then cut it in very thin slices ( please use a very sharp knife because the slices need to be really thin… of course i didn’t have any but i manage at least to cut it). The best is using a meat cutter. Cover each slice with a good amount of sauce and add some cappers just to give the final touch! PS. Mamy finalmente e’ arrivata un po’ d’estate anche qui ed io non vedevo l’ora di fare il vitel tonne’. Ok devo dire che me lo aspettavo piu’ rapido da cucinare, mentre invece la carne ha i suoi tempi, pero’ che buono. L’unico problema e’ che mi devo attrezzare cin coltelli piu’ fini perche’ con questi non riuscivo proprio a tagliare nulla! Will Burger King save our diet? Which is the biggest enemy of the diet? the sweet or salty snacks and the fried food sold in the street. Never like in London you can see so many take away shops and people eating this food in the street, on the tube, in the buses and even ordering them at home! And for how much you can try to put attention and to avoid it, there will always be the occasion in which you will have to raise a white flag to them… and it’s a classic especially in this city, where everyone drink without eating anything. After work you go to drink straight away… and at the end you are so hungry you could eat whatever is in front of you. Solution? Burger King is trying to help with this! Some week ago, after a party, i was really convinced to come back home to cook something. My friends weren’t thinking the same and we stopped in Burger King. Surprise surprise, they made a “light” Sandwich to help all of us with the diet. The Piri Piri Chicken sandwich is made of 3 chargrilled chicken strips, iceberg lettuce, red onion, reduced fat mayonnaise and piri piri sauce on bread baguette or sesame seeds bun. 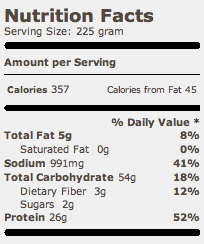 This reach an amount of 336-356 calories depending on the bread and it’s quite fulfilling. Considering that a plate of pasta of pasta (80gr.) with tomato sauce and Parmesan is around 450 cal, this sandwich is not so bad. Ok, the fact to eat this kind of food for quality and ingredients is not the best, but at least you can limit the damages without big privations. The other alternative it could be the normal basic burger (275 cal.) or the simple cheese burger (320 cal.) but they are so little and without great taste that are not an amazing solution: you can risk to eat more arriving at home! So, if you have one of this night where you have drunk quite a lot and you can’t wait to arrive home to eat, maybe this could be an idea to remain alive without taking a massive quantity of calories on top, and without renouncing to another little pleasure. What do you think? PS. Mamy oggi mi sono dedicata a suggerire un nuovo panino “light” che hanno creato in una di queste catene tipo Mc Donald. Non che sia fan di questi posti, anzi! ma talvolta quando si esce senza mangiare e si beve un po’, e’ inevitabile fermarsi in posti del genere. E dato che qui di negozietti per il pesce fritto e fastfood, ce ne sono un sacco, meglio andare sul sicuro con una scelta ragionevolmente leggera. Il problema e’ resistere alle patatine fritte! argh!